Sunday, March 21, 2010: Today is the first day of spring! However the weather looked more fall like….cool, overcast and breezy. 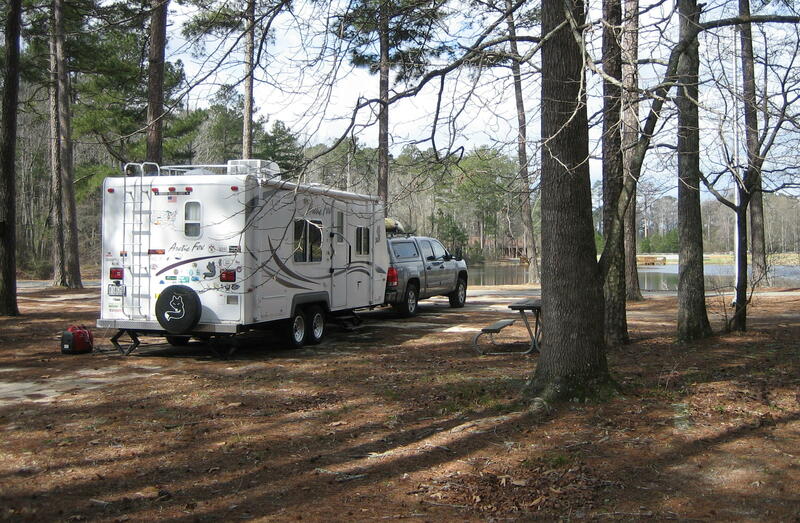 Even though this campground on Maxwell AFB is full to capacity there are surprisingly few folks about. Taking my morning walk I did spot one young fellow and asked where everyone was. Well apparently 90 % of the campers in the park are active duty military and since this facility is a major USAF training facility (including the War College) and since it is Spring Break Week…..most folks are gone on Spring Break. Looked weird, however…..kinda like a ghost campground! We broke camp and hit the road at 0930. Leaving the base we came upon the parade field with displays of vintage aircraft. Of course I had to stop and check them out. Left the base on I-65 East and after a few miles dropped down to US-80 toward Tuskegee, Alabama. 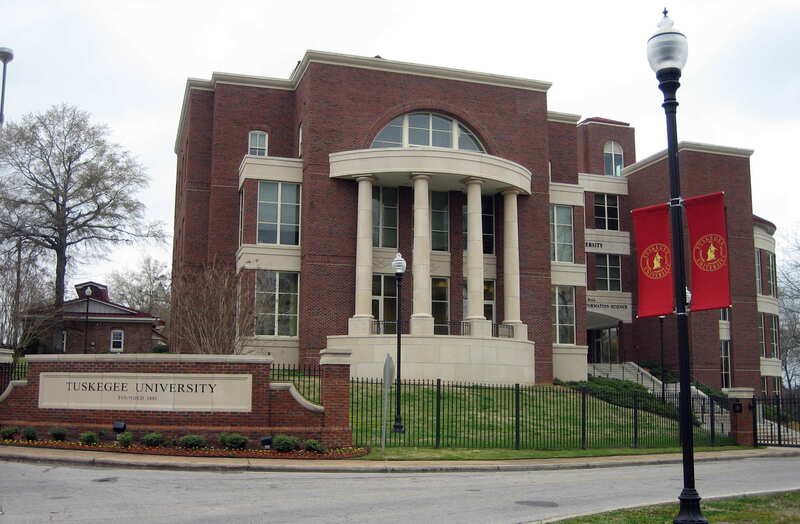 Entering the town we drove through the grounds of Tuskegee University and stopped to poke around. 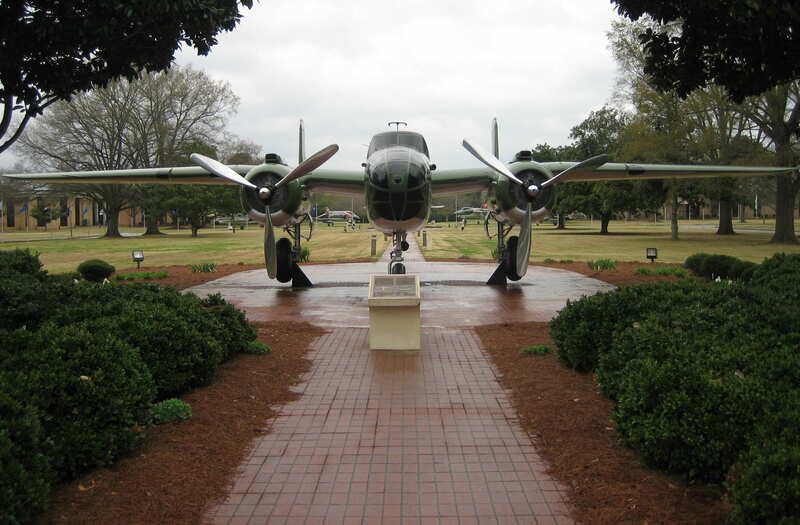 Tuskegee University is the alma mater of the famed WW II African American flying squadron “The Tuskegee Airman”. Their story of overcoming prejudice in 1930’s America and becoming combat pilots in the US Army Air Corps is legendary. We also walked by the home of Booker T. Washington, but we didn’t notice any MG’s parked around the place so not sure if it was “the Booker T”. 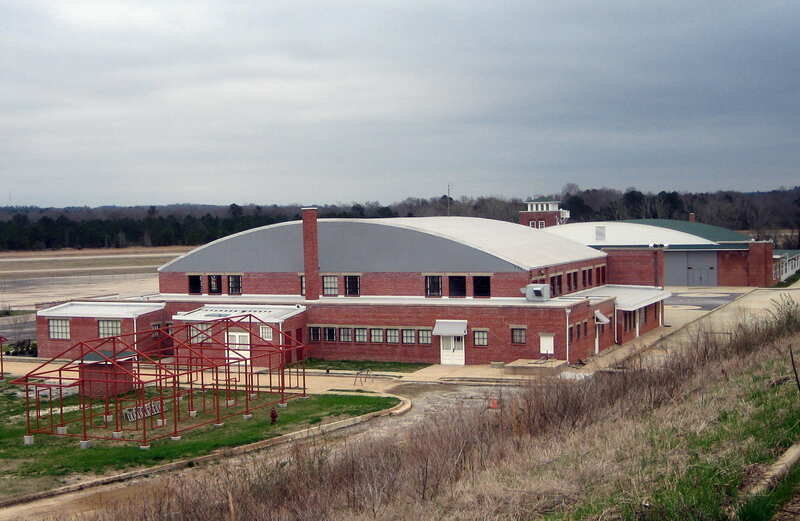 Leaving Tuskegee we drove out to Moton Field which was established by the WWII segregated Army Air Corps for flight training of their black flight training cadets. This National Historic Site is under development and the visitor’s center is currently housed in portable buildings. The history and artifacts contained within are very interesting and the 20 minute film chronicling the Tuskegee Airman was enjoyable and very informative. Kit went back to the trailer while I decided to walk down to the area where the hangers are being reconstructed to house the WWII training aircraft that will be brought here for display. When finished this National Historic Site will be an even more interesting place to visit. Moving on, heading east we passed into Georgia and decided to stop for the night at the Air Force Base in Warner Robbins. Pulling up to the main gate the sentry was frantically waving for us to stop. It was then that I noticed the various barriers, and spike strips impeding our way. The sentry was kind enough to guide us off to an alternate gate a mile down the road where a platoon of armed guards met us, opened the outer gate and motioned us through. They then searched the truck and trailer before opening the inner gate and sending us on our way. 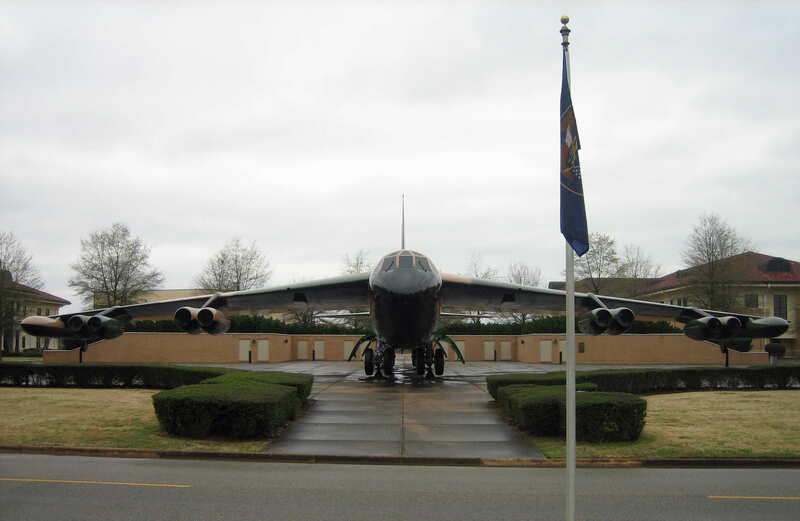 In 43 years living and working on military bases all over the US this place had the tightest security ever. Bet we will sleep well tonight. Arriving at the base campground which was on a pretty little lake we chose to stay in overflow. As we have learned in the past, overflow camping, even though there are no hookups, is more remote and therefore more private, quieter and usually more scenic. In addition it is always less expensive…..what’s not to like about all that. 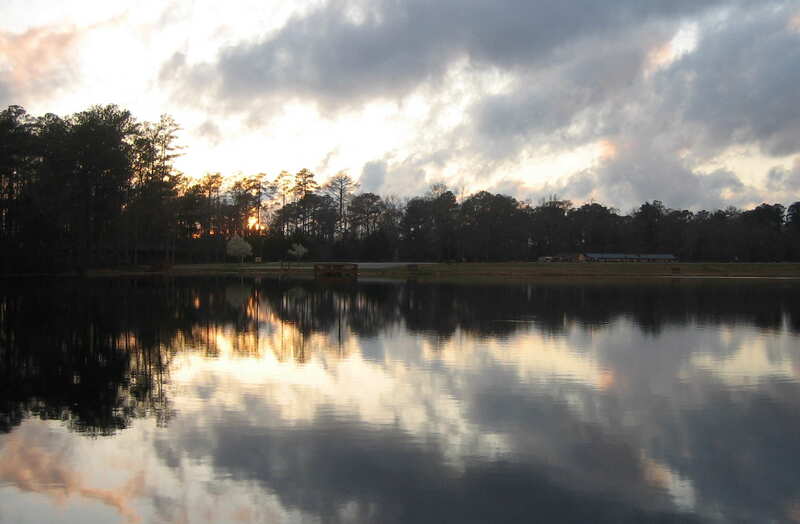 Here is the view of the sunsets from our site. There were train tracks nearby and each evening as we watched the sunset across the lake we listened to the trains and their mournful whistles pass off in the distance. The “peepers” were especially active chirping away…..it looked and sounded like upta camp back home. Speaking of camp we have seen quite a few Canadian Geese here on the lake. They are probably making a rest stop before winging up to Maine for the summer…..I bet they will beat us home. We liked this place so well we decided to stay an extra day. We spent our bonus day just hanging around, taking walks around the lake, handling online banking issues and working on the travel journal. 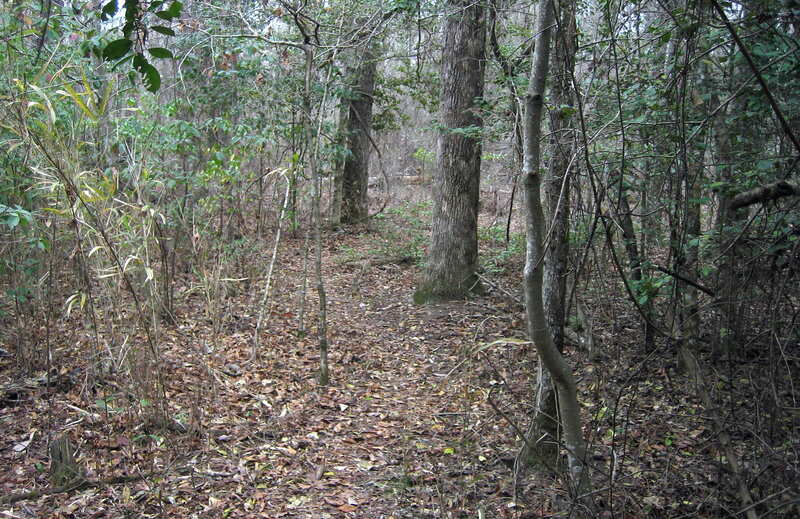 I also took the opportunity to explore the woods surrounding the campgrounds on my bike. There where a number of multi use trails and a 20 station Par Course. In addition some one built a very extensive loop of single-track with a few challenging sections. The latter wasn’t marked nor was it listed on the base trail guide and at times it was difficult to follow. All of which led me to believe it was designed, built and maintained by a group of energetic Mountain Bikers. 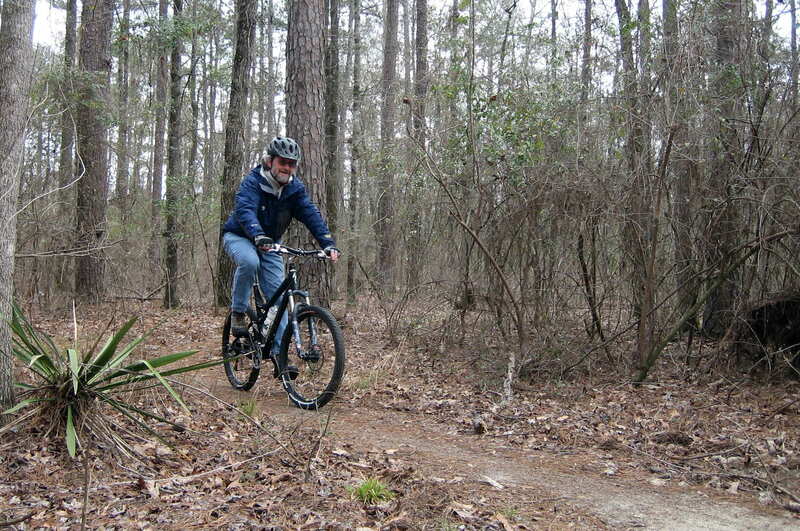 The approximately 2 mile single-track loop was so much fun I decided to ride it a number of times over the two day stay. 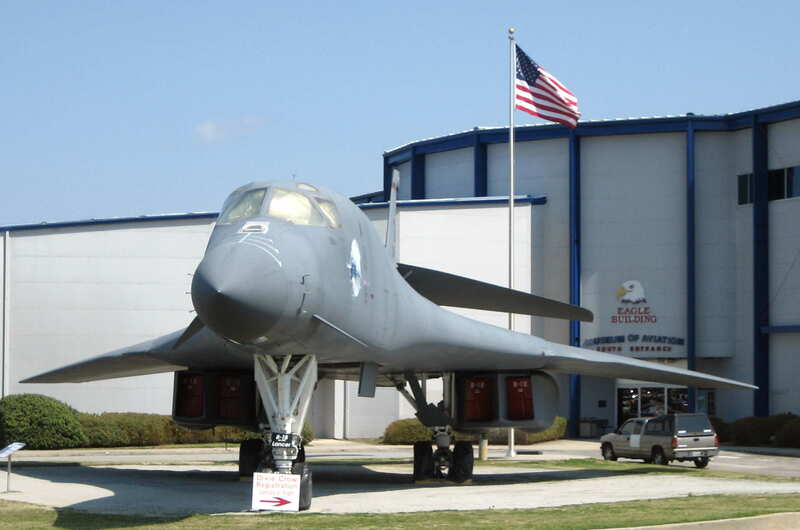 This place was billed as the second largest USAF Museum in the country; second only to Wright Patterson in Ohio. It was large, and it did have a lot of planes on display, however frankly, in my opinion, there are nicer displays at some of the other military bases we have visited. The inside was pretty good but most of the outside aircraft were in pretty bad shape…..not sure why, I can only hope this improves or some pretty significant historical aircraft are going to deteriorate beyond repair. 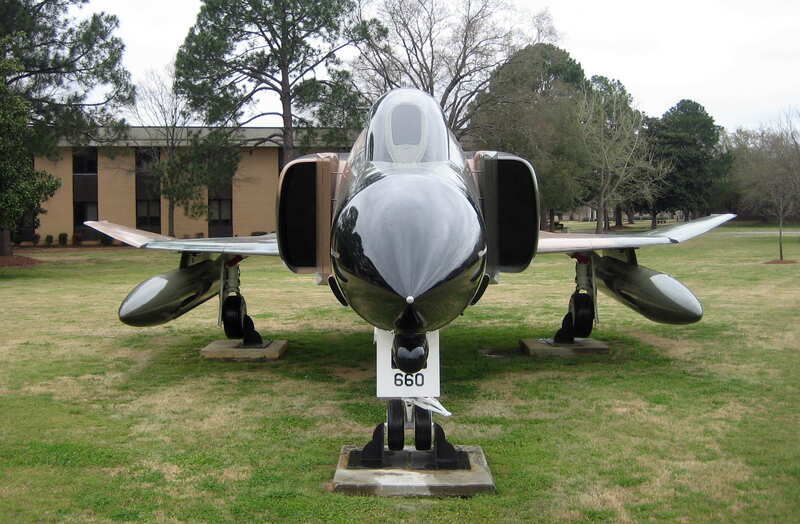 Kit’s Corner: We loved staying at Robins AFB. Being in overflow, we were off by ourselves and overlooking the small lake. The campground was actually near the military housing area so there were lots of active duty folks and kids in the area. We will certainly return to this base in the future. We had never heard of it!